From her opening shot, a teeming mass of humanity bathed in glistening crimson, "We Need to Talk About Kevin" director Lynne Ramsay puts her audience on notice that there will be blood. 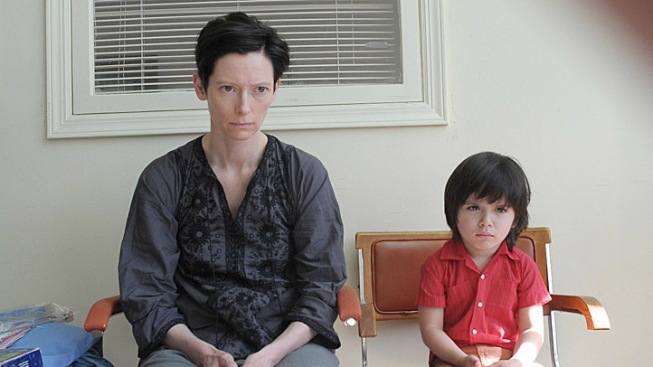 "We Need to Talk About Kevin" is a parent's nightmare, playing out like a sequel to "Rosemary's Baby," starring Tilda Swinton is Eva, a successful travel writer happily married to Franklin (John C. Reilly), with whom she has a son, Kevin. From day one, Kevin is more than Eva can handle, his screaming and crying so incessant that when she's out for a walk with her baby, she'll stop next to construction sites to enjoying the peace offered by the thunder of a jackhammer. And no matter how much she tries to convince Franklin that the boy ain't right, he just laughs it off, telling her, "He's just a kid." As he gets older, Kevin proves himself to be a world-class evil genius, tormenting his mother with virtuoso skill. Even when he inflicts pain on others or does something nice for Eva, it's always in the name of maximizing his mother's suffering. Swinton is her usual excellent self, painting Eva as a desperate and harried woman who can’t understand what makes her little monster tick, and fears deep down that she's knows the truth—he is a reflection of her. Kevin is portrayed different stages by three young actors—Rock Duer, Jasper Newell and Ezra Miller--each better than the last. As a toddler, he's obstinate and mute; in his middle years he's angry and mocking and cruel; by his teen years, he's a pure evil. What's amazing about "Kevin" is that Ramsay has managed to make a skin-crawling, but nearly bloodless, horror film. Instead of blood, we get shiny globs of jam, dried streaks of ketchup, buckets of splattered paint. In lieu of crushed bones, we get smashed eggs and pulverized cereal. And Ramsay deftly lets her story unfold by bouncing back and forth across Kevin's three stages, as well as Eva's life both before his birth and after his paints his masterpiece. The effect is often chilling, as you see the outcome of one of Kevin's escapades, putting you on edge for each scene that takes place beforehand. It's to the credit of Lionel Shriver, the author of the book, and Ramsay, that the story isn’t a polemic on violence in America. While there's no shortage of violence, "We Need to Talk About Kevin" is about confronting your darker side, and harder still, trying to find a way to make peace with it.